I have captured some 1080p video game footage with Open Broadcaster. Now I would like to edit it using the Blender video editor. First of all, if I understand this correctly, I have to set the frame rate with which I want to render the video but I am not sure what to set it to, after all games don't run at constant frame rates. Secondly I have tried dragging and dropping the clip I want to edit into the video sequence editor. Once I do that the video clip and the audio track that belongs to it show up, however they don't seem to be synced up and the video clip is far too short. Maybe this information is of any use: the original video is 04:12 minutes long. The audio track displays as being of exactly that length in minutes and 30412 in frames. The video clip is displayed as being two seconds long with 254 frames. I assume this has something to do with the end frame that can be specified but changing this to something higher has not solved the problem. Any suggestions are welcome! You need to find out what framerate your footage is at. A video is saved at a constant framerate no matter how fast the game runs. 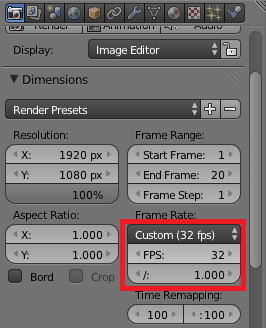 Find out what that is, and in the Properties Window on the Render Tab (the settings on the right which is usually hidden on the Video Editor interface), set the framerate. Also, set the player to A/V Sync (the button is right under the Timeline) so Blender will sync the audio and the video. Here was the best solution I came across. He just dragged out the end of the video snip by grabbing it then dragging, he added speed effect by selecting the strip and then going to Add > Effects Strip.. > Speed Control, then he made sure the box that says "Stretch to input strip length" in checked in the Speed Controls. Not the answer you're looking for? Browse other questions tagged editing video or ask your own question. How can I make my animation play for longer than 250 Frames? Is there a way to match audio and video length in blender precisely?